I haven’t mention that I used to make a wedding invites, birthday invites, and assorted cards for all occasion, videos and tags. I used to get a call from friends, family and relatives who knew my talent in creating sole invites and cards. And even though I was 9000 miles away from home, it never stops me from making one. Seeing as, t’was my dear brother’s wedding I volunteered to make a freebie for his special day. 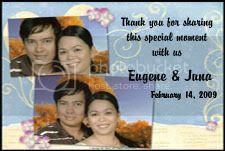 A wedding video and the giveaway tags, while it takes months for them to get my finished product, I make a layout here [US] and send it through e-mail in Philippines. this I've found It positively helpful and it has helped me out loads. I am hoping to contribute & help other users like its helped me. Great job. My blog has a lot of unique content I've either written myself or outsourced but it appears a lot of it is popping it up all over the internet without my permission. Do you know any solutions to help reduce content from being stolen? I'd certainly appreciate it. Hi there everyone, it's my first pay a quick visit at this web site, and article is genuinely fruitful in favor of me, keep up posting these articles or reviews.